It's an exciting day in the world of Jangles! I got the color proofs of my book! This is the final step before the book goes to the printer. I am so excited. So those of you who don't know, it's titled "Ceramic Bead Jewelry". It's being published by Lark Books and it will be out at the beginning of June. My book covers everything you need to know to make all kinds of wonderful ceramic beads. The book covers all types of decorating processes, like raku, underglazes, chalks, slips, and, more. 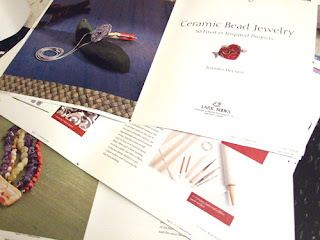 And if that isn't enough, I also have 30 jewelry projects in the book all with full page photos and complete instructions. The folks at Lark Books have done an amazing job with the layout and look of the book, I couldn't be happier. As you can tell, I am so excited about this book! I think you'll love it too.